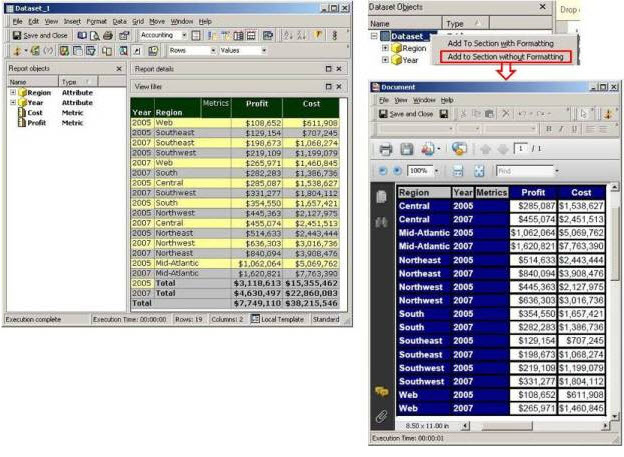 In MicroStrategy Report Services Documents, document datasets and their original source reports (such as a grid report being used as a dataset) are not completely connected to each other. Depending on the changes made on the source report, it can be reflected differently on the document. Basically, the change can be divided into two types. Formatting changes, for example, changing autostyles, thresholds, subtotals. If a user chooses the option Add to Section without Formatting, the grid/graph showing on the document will not use the report’s stored formatting. Any formatting changes on the source report will not be reflected on the document. If a user chooses the option Add to Section with Formatting, the grid will be added with the current format of the report. However, any formatting changes made to the source report AFTER the dataset has been included in the document will NOT be reflected on the document. For example, a user disabled the subtotal (see screenshot below) for the original report after the report has been included as a dataset in a document, the document will still show the subtotals. To force the document to recognize the report’s formatting changes, the user needs to delete the grid/graph from document section and add it again using the With Formatting option. By doing this, the latest formatting properties of the grid/graph on the source report are retrieved. Another type of changes made on the report involving adding/removing objects and modifying report filters. Unlike the formatting change, this type of change does carry over from the source report to the document datasets. For example, if users add/remove/modify report filters (see screenshot below), the change will be reflected on the data when running the document. 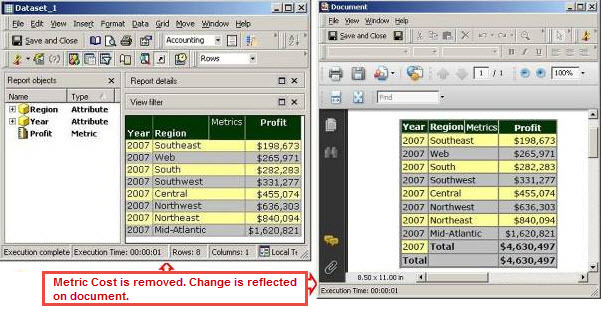 If an object is removed from the source report (see screenshot below), the user can see the change in the document’s Dataset Objects window. After the user runs the document, the object will be removed from grid/graph on the document. 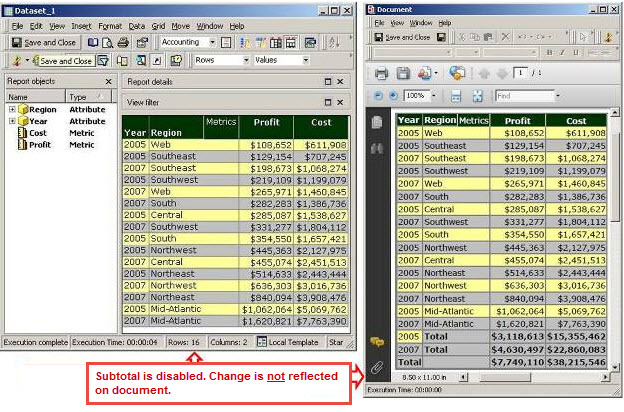 If an object is added to the report (see screenshot below), the change will show in the document’s dataset objects window. However, the object will not be automatically added to the grid/graph. The user has to manually add the object to the grid/graph or add the dataset to the section again to make it show up. If the grid/graph is added to the document using this option, then the document would be updated automatically if ANY type of change is made on the source report.